There are some words which don’t quite fit into an English definition, like schadenfreude (pleasure from someone else’s misery) or kummerspeck (the weight you put on from stress eating). Dipika Guha’s stellar new play demonstrates how ‘gaman’, too, is a word that cannot be served by our standards, and delivers it all in a mighty allegory about fish. The Art of Gaman follows the journey of Tomomi as a young girl arriving in New York from Hiroshima through the subsequent sixty years of her life, and explores huge and complex themes of identity, sexuality, gender roles, purpose, and unfulfilled dreams. She finds herself desperate to become an actress and share her story, but hindered by the social and cultural expectations of women, as well as the hostile attitudes towards the Japanese during and after the Second World War. Guha’s script manages to deftly navigate these lofty concepts with care and wit; it’s rich with metaphors about koi fish, radios, and sunlight, and creates a vocabulary of textual references that layer on new meanings when called back to throughout. Unfortunately, however, a few fluffed lines from the actors occasionally prevent the delivery from landing with the impact that was no doubt intended. Additionally, the scenes often felt quite filmic in their brevity and left a lot of momentous choices that the characters make to happen off stage. Luckily, Ailin Conant’s slick direction keeps the frequent scene changes characterful, allowing the energy to consistently simmer. This is aided by Helen Coyston’s smart and purposeful design which uses translucent curtains to instantaneously convey a number of locations and atmospheres. 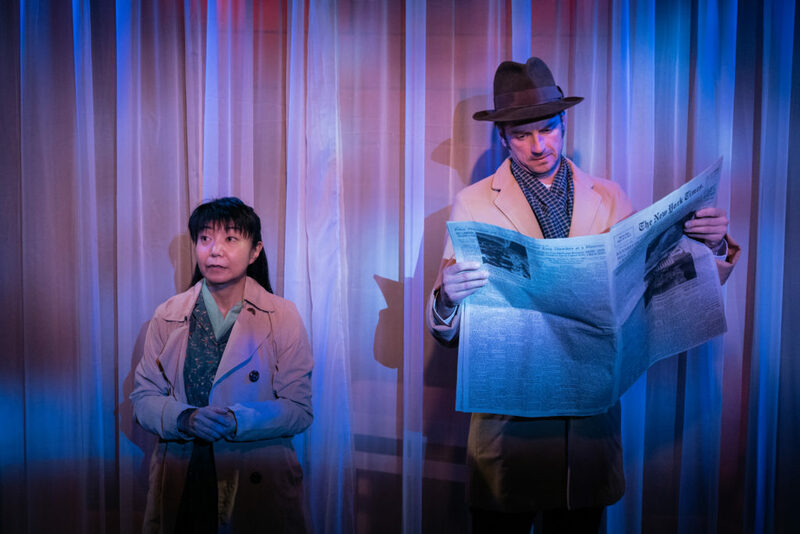 The performances from the whole cast were tremendous, particularly from You-Ri Yamanaka who primarily plays Tomomi – in an intimate space like Theatre503, the fact that she felt continuously spontaneous and authentic is all the more commendable. The other actors were tasked with depicting a variety of characters each throughout the story; Philip Desmeules and Alice Dillon especially succeeded in imbuing each one with an identifiable history from the moment they stepped into the scene, portraying exceptionally detailed and nuanced people in an instant. Gaman is presented in the play as something beautiful being born out of an arduous struggle, like how carbon needs to be placed under immense pressure to become a diamond. The Art of Gaman is immensely ambitious in its scope and themes but largely achieves gaman itself, and delivers on those ambitions with aplomb, and in doing so provides a platform for a story that is often ignored and marginalised.